Arogyaswami Paulraj and Sumita Mitra along with 13 other innovation pioneers would be formally felicitated during the innovation industry's most highly anticipated event - "The Greatest Celebration of American Innovation" - on May 2-3 organised in partnership with the US Patent and Trademark Office. Washington: Two Indian-American innovation pioneers -- Arogyaswami Paulraj for his MIMO wireless technology and Sumita Mitra for her nanocomposite dental materials -- have been inducted into the prestigious National Inventors Hall of Fame this year. National Inventors Hall of Fame, releasing its list of 2018 inductees, said Dr Paulraj's wireless technology has revolutionised broadband wireless Internet access for billions of people worldwide. "It is a wonderful honour. I feel enormously humbled to be counted among the inventors who have made the modern world possible," Dr Paulraj said. Last month, he assumed a chairmanship of the Department of Telecom's Steering Committee "to deliberate and finalise Vision, Mission, Goals and Roadmaps for 5G India 2020." "We in India are truly privileged to have Dr Paulraj guiding the DoT and the Government of India at this point in time and for taking the time out to help us put India on the 5G global map," Telecom Secretary Aruna Sundararajan said in a statement issued by IndiaTechOnline. Arogyaswami Paulraj said, "I have always felt that India needs to join the club of countries like US, China, Europe, South Korea and Japan that dominate communications and computing technology." 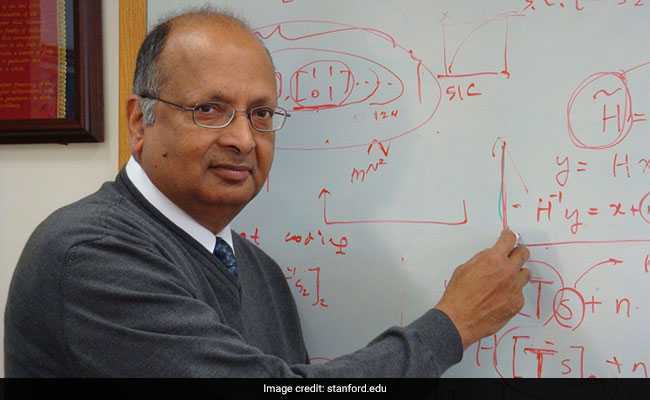 Dr Paulraj said when he joined Stanford in 1992, he had not worked in wireless technology, since his prior years in India were spent on sonar systems with brief forays into Artificial Intelligence and computing. "It was perhaps being an outsider that helped me come up with this transformative idea. Like many big breakthroughs, MIMO faced significant skepticism for a few years, but it eventually took off and is now the foundation of all wireless systems," he said. Dr Jagdish Chandra Bose, who is known for his breakthrough work in radio and microwave optics in 1904, is another Indian in the list of US patent holding pioneers in wireless technology. Born in Pollachi, Tamil Nadu, in 1944, Dr Paulraj joined the Indian Navy at age 15. Impressed with his academic record, the Navy sent him to the Indian Institute of Technology (Delhi), where he earned a Ph.D for advances to signal filtering theory. He served the Indian Navy for 25 years where he led the development of the world-class APSOH sonar, one of India's most successful military development projects. He also founded three national laboratories spanning High Speed Computing, AI and Robotics and Military Electronics. He joined Stanford University in 1992 where he did all of his work on MIMO. Currently a professor emeritus at Stanford, Dr Paulraj holds 79 patents and has won several global distinctions. These include both the two top global honors for telecom pioneers - the 2011 IEEE Alexander Graham Bell Medal and 2014 Marconi Prize and Fellowship. In 2010, he was awarded the Padma Bhushan. Sumita Mitra, 69, has been inducted in to the Inventors Hall of Fame for invention and US patents for the noncomposite dental filling material Filtek Supreme Restorative, used in over 600 million procedures so far. In the late 1990s, Dr Mitra, a chemist at 3M Oral Care, the dental products division of 3M Company, invented the first dental filling material to include nanoparticles. The new composite filling material, called Filtek Supreme Universal Restorative, is a versatile material that could be used for restoring teeth in any area of the mouth; mimicked the beauty of natural teeth; had better polish retention; and exhibited superior strength than existing dental composites. Dr Mitra holds 98 US patents and their international equivalents. Her inventions have led to a number of breakthroughs in dental technology, including nanocomposites, resin-modified glass ionomers and dental adhesives. Other products that have resulted from her innovations include Viteremer and Vitrebond Resin-modified Glass Ionomers, RelyX Luting Cements, Scotchbond Multipurpose Adhesive and APC Orthodontic Bracket Adhesive. She earned her Bachelors in Science in chemistry from India's Presidency College, her Masters in Science in organic chemistry from the University of Calcutta and her PhD in organic/polymer chemistry from the University of Michigan. Sumita Mitra retired in 2010 after more than 30 years with 3M, and now runs Mitra Chemical Consulting LLC with her husband. A former Science Coach for the American Chemical Society, she also maintains a close relationship with the Minnesota Dental Research Center for Biomaterials and Biomechanics at the University of Minnesota of which she was Industrial Director for nearly ten years.